Section of rusted ballast tank. Smooth finish, excellent bonding strength Airless spraying MarineLine. No spraying problems such as nozzle plugging, sagging, running, pinholing or overspray occurred. 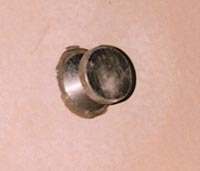 The resulting coating film showed a very smooth finish. Final DFT range, measured with a POSITECTOR 1000, was 240 to 450 microns. Therefore MarineLINE® can be applied, without significant problems, like a traditional tank coating with satisfactory application properties. End of heating: 24.00 hrs. Heat curing Completion of heat curing Finished coating. MarineLINE®, if compared to epoxy coatings with high chemical resistance, has better mechanical properties such as elasticity, impact resistance, and adhesion strength. The data provided by APC shows significantly higher values when compared to epoxy coatings. The applied coating also showed very low values of surface roughness: Ra 0.7 - 0.8 (measured with a SURF TEST 30) compared to RA 1.5 - 2 for epoxies. These values mean a very smooth, non-stick surface, which is easy to clean. The data mentioned above indicates that MarineLINE® has excellent resistance against mechanical damages and - due to its high adhesive strength - should not be subject to under rusting. Furthermore, the coating, owing to its higher elasticity, has a better tolerance to possible mechanical stress and thermal expansion of steel structures than epoxies. Pull testing. Testing 98% sulfuric acid MarineLine exhibits high adhesive strength. Testing 37% hydrochloric acid. Testing methylene chloride. Testing cellosolve. The resistance tests lasted 14 days for the acids and 22 days for the solvents. Fresh water was added to the methanol after 22 days in order to test the coating resistance against blistering. The coating areas in contact with the chemicals performed as reported below. Sulfuric acid 98%. No softening, swelling or chalking. Coating surface slightly matted showing some pink stains. High resistance epoxy coatings disintegrate within a few days in 98% sulfuric acid. Hydrochloric acid 37%. No softening, swelling or chalking. Coating surface still glossy but the colour had changed to ruby red. Methanol. No softening, swelling, chalking. Coating surface still glossy. No blistering after one week of subsequent water immersion. High resistance epoxy coatings usually suffer blistering if subjected to methanol/water immersion. Methylene chloride. No softening, swelling or chalking. Coating surface still glossy. High resistance epoxy coatings suffer softening, swelling and peeling within one week in methylene chloride. Cellosolve solvent. No softening, swelling or chalking. Coating surface still glossy. The test results comply with the resistance list provided by APC and confirm also that the heat curing was carried out properly. The only anomalies found were the colour change in hydrochloric acid and the slight staining in sulfuric acid. According to APC, these phenomena may be avoided if the heat curing is carried out at 125° C, but this assertion has to be verified. MarineLINE®, if compared to other available tank coatings such as epoxies, epoxy phenolics, epoxy isocyanates or zinc silicates offers several advantages, especially in the case of chemical carriers. Unlimited cargo range: All common cargoes can be carried without limitations, the only restriction being the tank equipment material (pumps, pipes, valves etc.). All other available tank coatings have a limited cargo range. For instance, organic coatings are unsuitable for aggressive cargoes such as phenols, amines, methylene chloride and most acids. Zinc silicates are suitable for strong solvents but have limited pH tolerance (pH 6 - 9.5). Easier cargo handling: Organic coatings are subject to absorb a certain percentage of strong solvents and therefore must be given time to dry out and recover after an aggressive cargo. If the carried solvent is water soluble, complete drying before water washing or carriage of watery cargoes is mandatory. Zinc silicate coatings have a porous structure, which can make cleaning after some cargoes very difficult, and zinc salts may contaminate cargoes such as aviation fuels or foodstuffs. These restrictions result in loss of cargo time and limitations for cleaning operations. MarineLINE®, as stated by the manufacturer and verified by the above mentioned immersion tests, has very low absorption values posing no limitations to cargo sequences and making tank cleaning easier. Duration of the tank coating: The duration of an organic tank coating depends on service conditions. If aggressive cargoes are carried frequently, the coating film ages and weakens earlier due to continuous solvent absorption/evaporation, shortening the service life. However, given the low cargo absorption of the coating film, the useful service time could be significantly longer than for organic coatings. A possible disadvantage of MarineLINE® is the necessity to heat-cure touch-up spots. Notwithstanding the solid mechanical resistance of MarineLINE®, mechanical damages may occur and must be repaired, requiring the availability of a heating device on board. Tanks coated with MarineLINE® have a broader cargo range than stainless steel tanks, since, for instance, halogenated compounds are not recommended for stainless steel. Another example is sulfuric acid, which is suitable for stainless steel at concentrations over 90%, but becomes corrosive to stainless steel at lower concentrations, posing some problems when, after discharging, the tanks have to be water washed. The range of cargoes carried in tanks coated with MarineLINE® is limited only by the cargo equipment, which is usually made of stainless steel and hence restricts the suitable cargoes. MarineLINE® coatings offer a very significant economical advantage, whencompared to stainless steel, allowing at least the same cargo suitability at a much lower cost. However, it must be pointed out that in the case of acid carriage, coated tanks run a higher risk. If undetected mechanical damages occur, damaged spots may suffer severe corrosion with possible perforation of tank plates. Notwithstanding the solid mechanical resistance of the coating, accidental mechanical damages may always occur. For this reason, in the case of chemical carriers dedicated to acid transportation, stainless steel tanks are preferred. For all other cargoes, MarineLINE® is economically more convenient than stainless steel. MarineLINE® is also suitable for occasional acid transportation, provided the tanks are inspected for possible damage spots before loading and after unloading. MarineLINE® is a two-component coating with excellent application properties, which can be applied following regular tank coating procedures. The only additional requirements are a heat curing and final spark test (holiday detector test). The heat curing can be carried out with hot air in a reasonably short time (12 hrs at 71° or 4 hrs at 93° C). According to the chemical resistance tests carried out, MarineLINE® coatings comply with the resistance list provided by the manufacturer, with the exception of a color change in strong acid immersion. Although only a limited number of tests were performed, the suitability to these few, very aggressive chemicals indicates a superior chemical resistance and very low absorption rates, unparalleled by traditional tank coatings. For chemical carriers of all IMO classes, MarineLINE®, owing to its unlimited cargo range as well as owing to easier cargo handling and tank cleaning, offers significant advantages over traditional coatings. For product carriers, mainly if the carriage is limited to "white oil products," traditional tank coatings may be economically more convenient. If compared to stainless steel tanks, MarineLINE® offers the same cargo range (limited only by the equipment material) at a much lower cost. However, in the case of dedicated acid carriers, stainless steel tanks should be considered a safer choice.